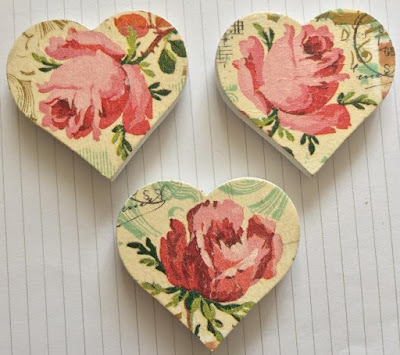 World of Handcraft is a cute Etsy shop which sells pretty decoupaged home decor. Urszula from World of Handcraft on Etsy was kind enough to send me some beautiful decoupage fridge magnets. The magnets are made from solid wood and they're heart shaped as you can see. They arrived in a cute organza bag so they're perfect for gift giving. The magnets themselves are nice and large which is nice, they're pretty amazing value. They're decoupaged very neatly. There's no bubbles or folds to be seen - so I'm pretty impressed. They're the neatest item I've received so far when it comes to decoupage! I'm so pleased with these magnets, they will look beautiful on my fridge and compliment the country kitchen theme that I have going on! Check World of Handcraft out here.